This is a beat-em-up from Strata, the fly-by-night company that would go on to release Time Killers a year later and BloodStorm in 1994 before folding up. I'm honestly not seeing where the "ninja" portion comes in, other than that pressing the kick button sometimes unpredictably makes the clown fly across the screen in some sort of weird and totally ineffective aerial attack. So it's really like a 98% clown to 2% ninja ratio. Along with 100% garbage gameplay. Though the art is actually kinda surprisingly detailed and drawn in an unusual-for-arcades comic style, the animation is choppy and extremely low in the frame count. 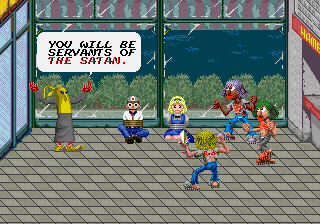 Unlike other oddball cartoony ninja games like Ninja Baseball Bat Man or even the racist-adjacent Ninja Kids, there's really absolutely nothing fun about this. There's no hook but perservering to see the bizarre and sometimes disturbing enemy lineup, headlined by a truly awful anthropomorphic chicken that might just put in an appearance in your nightmares. If the tiny hard-to-hit enemies like the mini-clowns or the chattering teeth don't frustrate you into taking off, the cheap and spazzy bosses twitching around the screen being maddeningly difficult to line up hits on will.